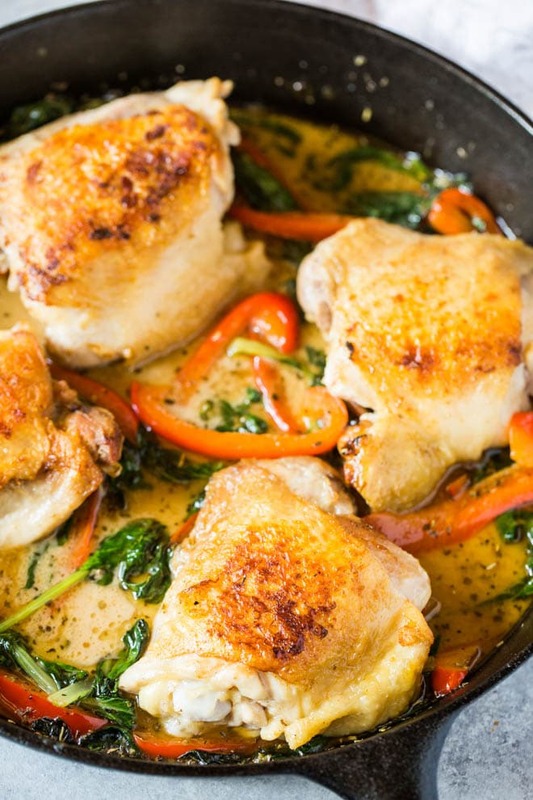 Creamy Chicken Skillet with Red Pepper and Greens is a simple meal made in one skillet! The meal cooks in under 30 minutes and is made with a creamy garlic basil sauce. 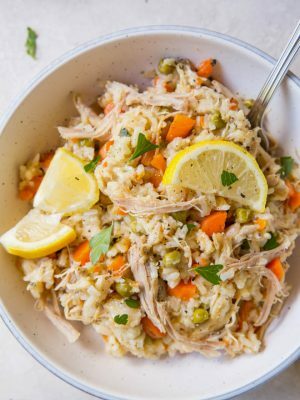 Are you looking for another easy one pot meal? 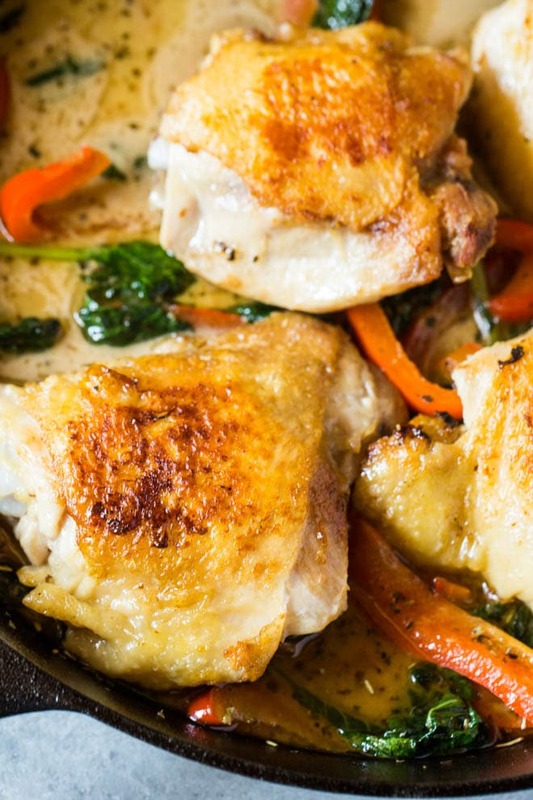 Creamy Chicken Skillet with Red Peppers and Greens cooks in one skillet in under 30 minutes. 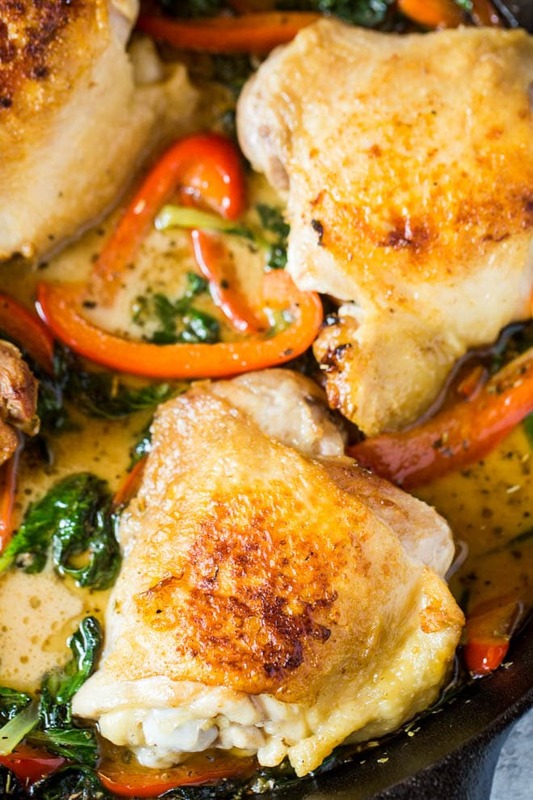 Chicken Thighs are sautéed with a creamy garlic basil sauce made with coconut milk. 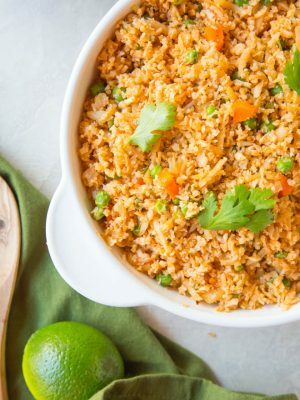 The meal is simple and packed with flavor. 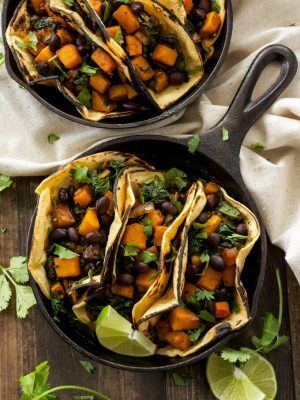 It is the perfect option for dinner any day of the week! 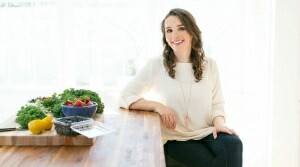 For this recipe, I use organicgirl Rebel Greens. The baby bok choy leaves are super nutritious like kale but have a mild taste and texture. 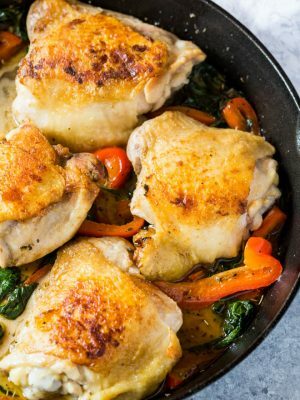 They are the perfect addition to this easy Chicken Skillet. 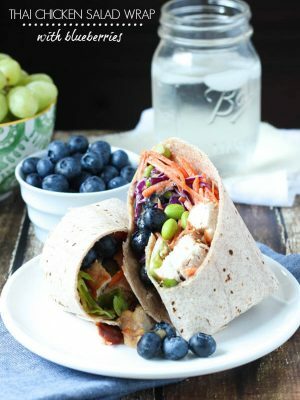 You can use any of your favorite organicgirl greens in this meal. 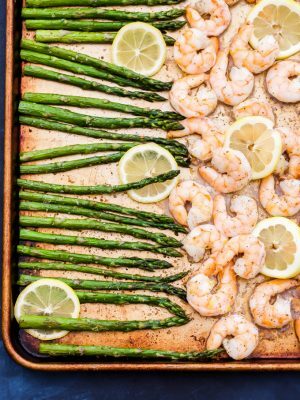 Combine them with sliced red pepper and a creamy garlic sauce to create a meal made in less than 30 minutes. 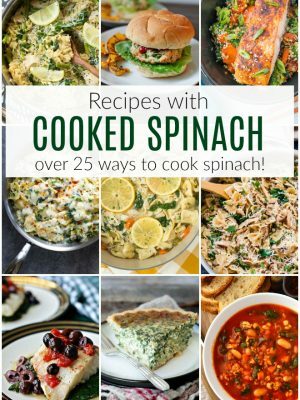 Did you know that greens cook in less than 5 minutes and are the perfect addition to any meal? 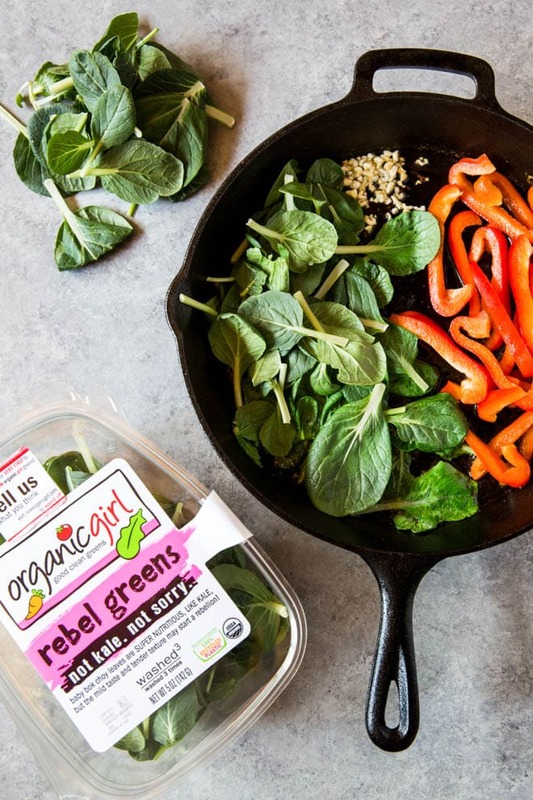 Grab a few handfuls of organicgirl greens and add them to a one pot dish, breakfast quiche, salad or stir fry. 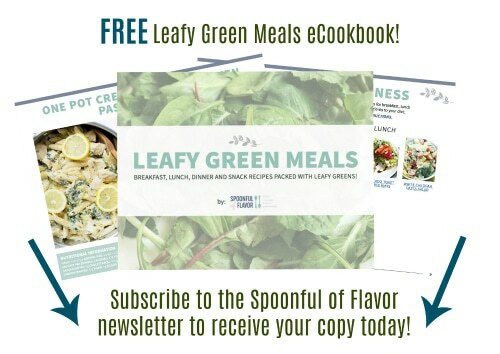 Adding greens to every single meal is a simple and healthy way to eat more nutrients. 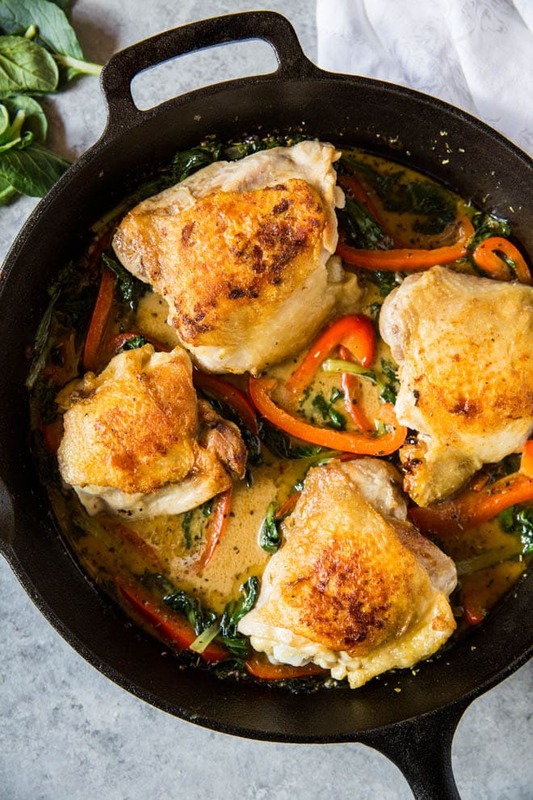 In a large skillet add the ghee or butter and cook the chicken on medium heat for 7 to 8 minutes on each side or until brown. 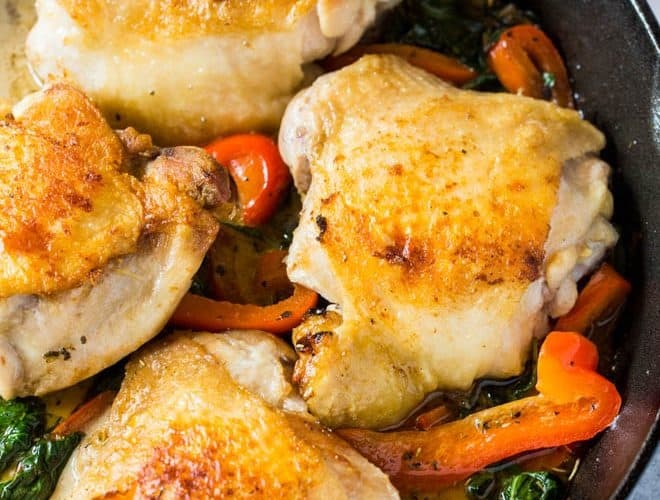 Remove the chicken from skillet and set aside on a plate. Add the red peppers, greens and garlic. Cook for 2 to 3 minutes. Add the coconut milk, broth, and dried seasonings. 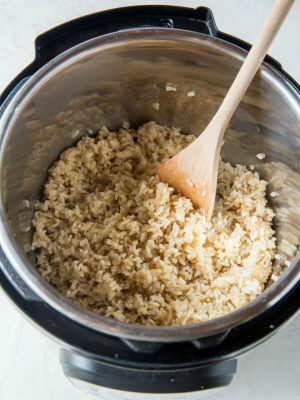 Whisk over medium heat until combined. 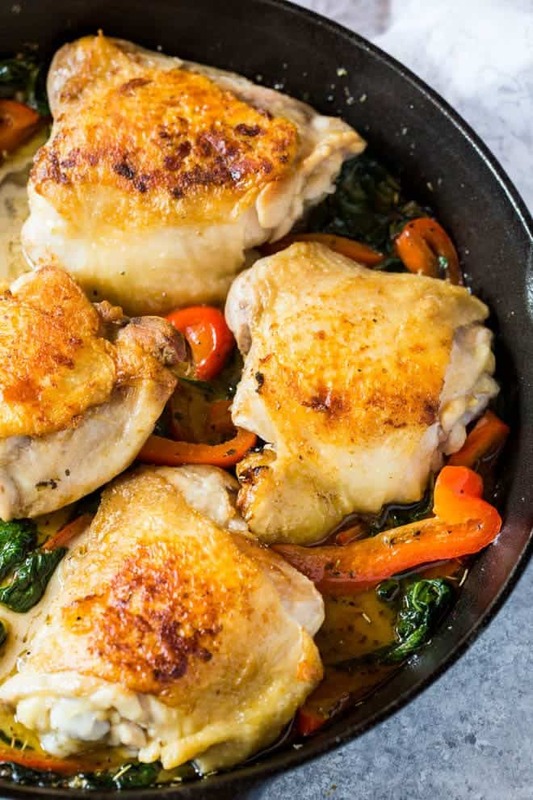 Add the chicken back to the pan, reduce to a simmer and continue cooking for 5 to 10 minutes, or until chicken thighs reach an internal temperature of 165F. Enjoy! Note: You can reduce cooking time by flattening out chicken thighs or by using boneless chicken thighs or using chicken breasts. 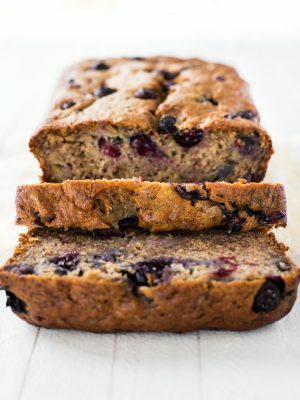 This looks and sounds amazing, going to make and devour it.